Home » Doing It Ourselves / Simple Living » We Should Have Wondered Where All Those Rocks Came From! Our land is edged on all sides by beautiful old stone walls. Since ours is the first house ever to be built on this land, the stone walls were obviously begun when the land was first cleared for farming over two hundred years ago. Through the years as the soil was worked, more rocks would have been added to the walls. 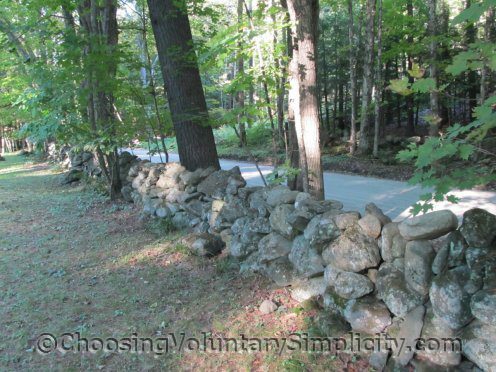 Although stone walls are not an unusual sight in New England, the extremely long expanses of stone walls that we have here should have made us wonder where all those rocks had come from. Once we started making gardens and digging holes for planting, we found out quickly that this good, rich soil was packed full of rocks. In all the years we have lived here, I can’t remember digging even a small hole that didn’t involve having to remove a large number of rocks. 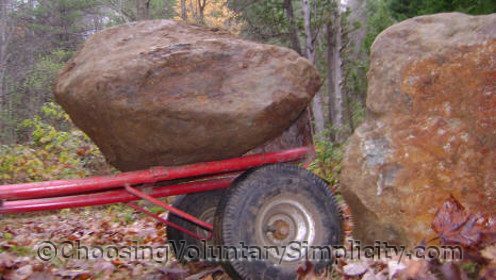 Many of the rocks are larger than two people can handle, but we eventually learned the easiest way of hoisting the really big rocks up and out of the way without heavy equipment. After a while it turns into a challenge. I thought some of you might be interested in seeing the process. Last fall my husband optimistically started digging this hole for a plum tree we plan to buy this spring. 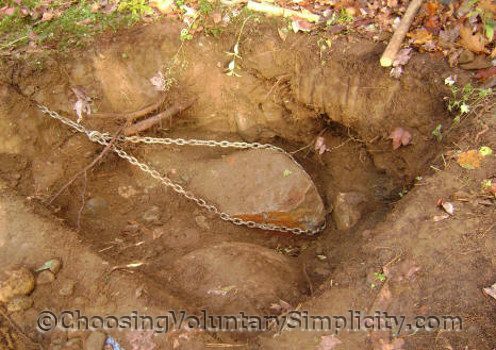 The first few inches of digging were easy, uncovering just a few medium-sized rocks that were easy to move. 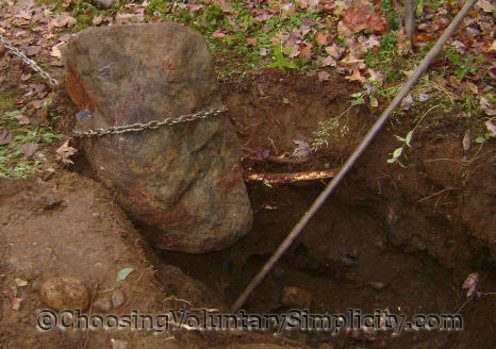 Under those he hit some substantial rocks… several of them wedged together… and all of these rocks were too large and extended too far down into the soil to be dug out with a shovel. It’s at this point when we bring in a heavy duty winch and a logging chain. Usually there is a tree nearby that can serve as a weight to pull against. The tree in this picture is a dead tree that had its top sheared off during an ice storm a few winters ago… otherwise we would have put several layers of cardboard under the chain to protect the tree from damage. We’re very careful about that. In the beginning it’s difficult to position the chain correctly because usually there isn’t enough of the rock exposed, but even if the chain falls off, that first winching will usually move the rock enough so the chain can be put completely around it. I position the chain while my husband holds the rock steady. Once the chain is completely encircling the rock, more winching will result in the rock starting to move upward. Eventually most of these big rocks will rotate so they are practically standing upright in the hole, which only makes them more of a problem because they are always too heavy to lift out. The solution is to keep winching and keep the chain from falling off… this eventually drags the rock out of the hole. This is where a strong chain becomes really important. 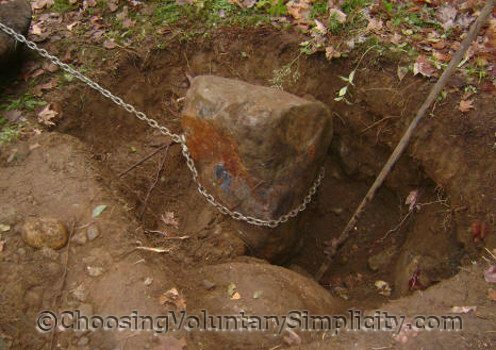 It’s a very sad thing when the chain breaks from the strain and the rock falls back into the hole! The first rock we removed that day was actually one of the smaller rocks in this hole. The shovel next to it will show you its relative size, but because of the way the rocks were packed so tightly together, it still took almost an hour to get any movement in the rocks and to pull the first rock out of the hole. With the first rock successfully out of the hole, it was time to tackle the next one. We use the same procedure for each rock, and it is often slow going… although usually every rock that is removed means that the tension is reduced and the rocks that are left will come out more easily than the first ones. At least, that is the theory! 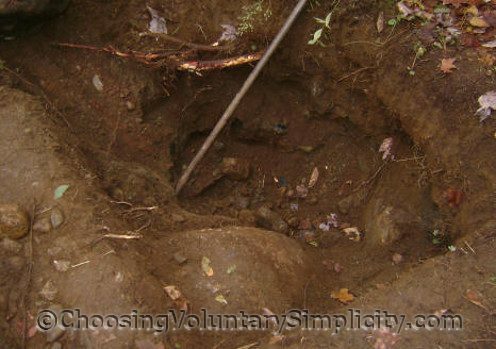 We wanted this hole to be roughly three and a half feet long and three and a half feet wide, and deep enough to accommodate the root ball for a good-sized plum tree. The biggest rock went so far down into the soil, removing it resulted in the hole being deeper than we had originally planned. The hole also ended up being somewhat wider and larger than our original intentions because several of the other rocks extended underground past the borders of the hole. This almost always happens. 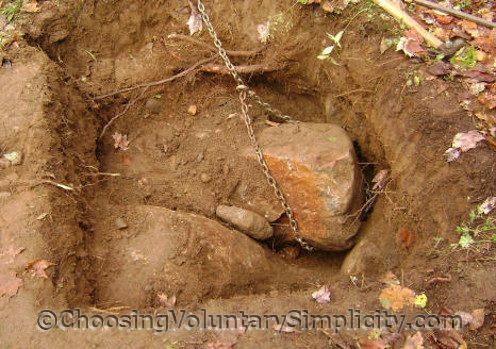 These photographs show the crop of rocks that we ended up taking out of this particular hole… the pile of big rocks that were heavy to lift and hard to move… and the little rocks that we could take away in a wheelbarrow. And yes, all of these rocks came out of this one hole. The rock sitting on the hand truck is the first rock we winched out of the hole in these photographs. The bigger rock next to it was the second rock out. That one was almost too heavy to move on the hand truck, and when my husband was winching it out, the dead tree that the chain was around started to make ominous cracking sounds against so much weight. At one point the cracking noise became so loud, we seriously thought the tree was going to break. Fortunately, it did not. With all the rocks out of the hole, there wasn’t much soil left. Since this is almost always what happens, we try to dig holes months before we will actually need them. This gives us time to bulk up whatever soil is left with our wonderful compost. This particular hole needed a LOT of compost, but the soil will be ready by the time our plum tree is ready for planting. 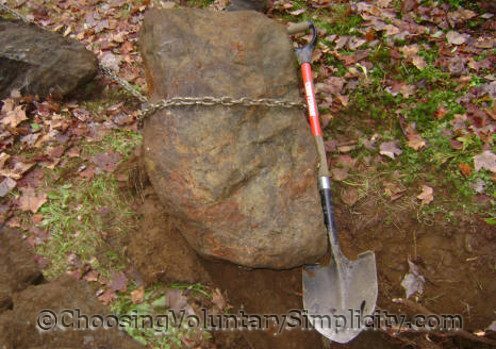 We have to do something with all of these rocks we dig out, so we have created an out-of-the-way (out of sight) area that we call “the quarry.” We roughly group the rocks according to size… one area for the largest rocks… and another for rocks that are a good size for rebuilding or extending the stone walls. When we dig up flat rocks that would be suitable for “pavers,” we separate them out too so we can find them easily for building another stone path. The small rocks get dumped in another area of the quarry to later be used as fill. What Will Ten Dollars Buy Where You Live? Wow! I wish I could have been there to see all those beautiful rocks! This kind of reminds me of Virginia and the Blue Ridge. It was a wonderful place to grow during my teen years. I still love rocks….and trees…and the leaves. This is AWESOME. You have such beautiful gardens and plants but I can see that you have worked very hard to get them. I have never seen so many rocks anywhere. Extremely interesting post. Very clever. I bet it took a lot of trial and error to come up with the right method. I’m one of those people who have to buy rocks when I want them. I don’t know what I’d do if I had access to all those rocks! The area I’m going to be gardening in is pretty rocky too, but I don’t think I’ve seen any quite that size! I love your rocks! It looks like a ton of work. The rocks all look smooth. I wonder if there was a river or stream there at one point in time? 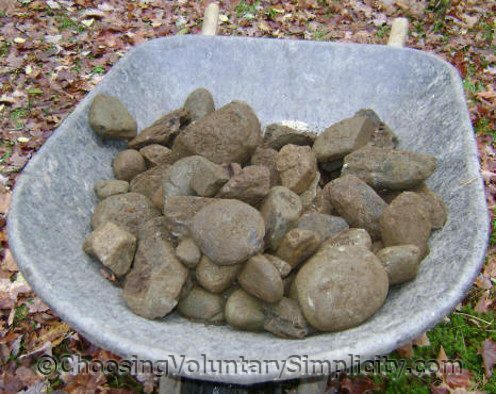 I edge my garden beds with rock – I get permission to take them from construction sites and haul them into my yard. It’s a lot of work, but I think removal looks harder. Same here! My parent’s foundation for their home (it was at one time a 4 room summer camp) is actually half ledge. Whoever built the original building gave up digging around it and incorporated it. Gotta love “The Granite State”! Love your blog and that man of yours for not giving up. I can’t believe all those rocks! We have about 50 acres in ME I’d like to settle on with our boys. It’s beautiful, but every place I dig to plant something I hit ledge. We will need to blast first for a home. No wonder we got a great deal on the land. I’m jealous. I now live in South Carolina…and my husband and I do a happy dance every time we find a rock bigger than my foot lying out in the woods…they aren’t plentiful around here. I grew up in PA, so I remember well all of the rock walls. Wow. I just dug my first garden and hit some large rocks. None were as massive as these! It is encouraging to see you guys handle such beasts. After they came to dig the foundation for my new studio, we have ended up with “tons” of beautiful stone. Of course, it is all in the wrong place and so I’ve been asking around for ideas, plus find ways to save our 60+ year old spines. Not wanting the bob-cat to come back, we were not sure what to do. Ironically before any of this work happened, I’ve wanted to call this new studio “Gathered Stone Studio”, the subject of my paintings are stones and the beautiful free standing wall we have here in RI. We’ll get there. Great to have found this site. many thanks. Wow! Those are some big rocks! I’m assuming that Glaciers were responsible for planting those bad boys, though I don’t know where you live, so I’m only guessing. Geologists will definitely tell you that where people have decorated with large rocks, there are more large rocks nearby! I really enjoyed seeing your method for removing rocks. I live in NH and we have exactly this issue. 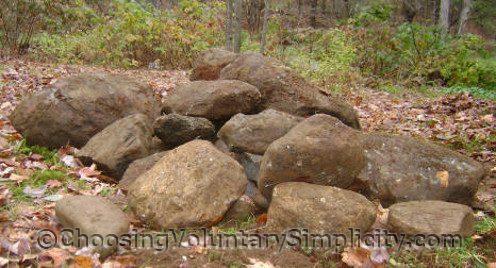 I’m amused at the thought that in a couple hundred years, people will see your piles of rocks and come up with all sorts of ideas of what they might be or signify, just as we do with common rock piles we find in the woods today! I smiled all the way through this blog entry. We live in an area exactly like what you describe. Every time we stick a spade in the ground, we hit a rock, or two, or ten. We joke and say the glacier that went through dropped way more than our fair share here…but we have some magnificent rock walls! Loved the article. I just discovered your site… And I’m very much looking forward to reading your insights and inspirations in more depth. I’m looking for peace and simple living after years of chaos. Your site is very beautiful! Thanks for sharing your experience! I did wonder where those rocks come from. Now I wonder if generally that’s how it is underground.